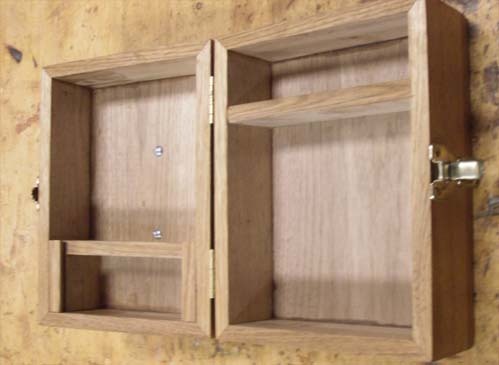 A close-up of one of the toolboxes shows the detail required for this special project. 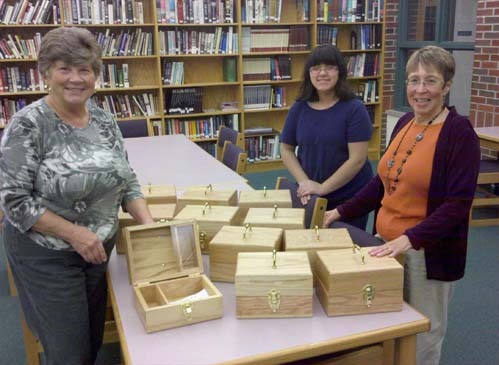 Alaina Trout, Jewelle Franklin (assistant to the instructor), and Erica Bartosiewicz stand with the student-made rug hooking toolboxes, as Mrs. Trout received the boxes on behalf of the woodworking classes of Onekama High School. When teachers give students the opportunity to participate in real-world learning, the results are often exceptional. This proved true for the woodworking classes at Onekama High School, who used their talents to help a local business person. Under Toelle’s direction, the Onekama High School fourth and fifth hour wood shop classes mass produced the rug hooking tool boxes over a six week period. The boxes were put on exhibit in the school’s display cases for a few weeks in order to share the results of the students’ hard work with the school community, and then they were given to Mrs. Trout with excitement and pride. OHS woods program students show off the results of their handiwork.